Only registered devices may be connected to the TRIUMF cabled network. Under no circumstances should network equipment be disconnected from the network unless permission is obtained from those responsible for the equipment. Many devices at TRIUMF may appear unattended, but are accessed remotely. Some network wall-outlets (Ethernet ports) are for special purposes, such as wireless access-points, cameras, and so on. PCs and laptops should not be connected to these Ethernet ports. There are four wireless networks available at TRIUMF. eduroam Education Roaming (eduroam) is the secure, world-wide roaming access service for the international research and education community. TRIUMF IoT is intended for stationary wireless devices such as wireless cameras and digital displays. Devices connecting to TRIUMF IoT are placed behind the perimeter firewall. TRIUMF Visitor is intended for short-term visitors to TRIUMF. It requires no authentication and has the same access to internal resources as connections from off-site. 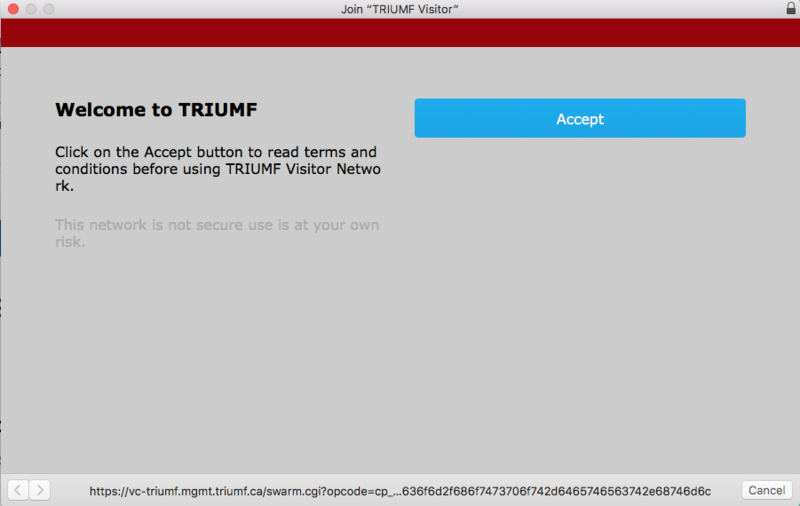 After connecting, a web page will open automatically welcoming you to TRIUMF. You will be asked to click on the Accept button to acknowldge the Policy on appropriate use of Internet at TRIUMF. TRIUMF Secure is for use by all TRIUMF employees, and others that require a network connection with internal access to TRIUMF resources. You will need a TRIUMF TRIDENT username and password to authenticate. This connection uses WiFi Protected Access II (WPA-2) Enterprise and Advanced Encryption Standard (AES) for an encrypted and secure wireless connection.